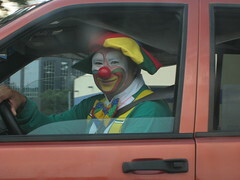 I have a funny clown-in-a-car story for you. About 20 years ago, I was coming home late night from being out at the bars on Halloween night. I was stopped at a light when I noticed the red Corvette standing to my left had a clown in the passenger seat, obviously returning inebriated from a Halloween party, when all of a sudden the window opens, she pops her head and out pukes down the side of the door of the car. The driver was furious! I howled and drove away. I found it amusing... and a little creepy. I had to get my camera haha.